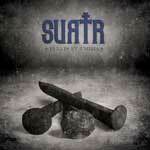 Surtr releases its second full-length album. Pulvis et Umbra collected seven new original doom metal tracks. At last, for object's aficionados, the album is also released exclusively by Altsphere Production as a transparent blue vinyl LP limited to 300 hand-numbered copies and inluding CD, stickers and a button (only for the 100 first copies). Even if there were already a lot of elements in the first album, there was a change between the two. What is it due? Water has flowed under the bridge since World of Doom. We worked a lot in rehearsal pieces to give them a true cohesion and more dynamic. I think we mostly grow as a trio, as each has its place and we feel more free to go musically where we see fit while remaining true to the group's identity. How was the recording of? From the start, we wanted to record in the most natural way possible and live. Trio, we really play together and be able to look for the chemistry works and energy flows. We got in the studio with well prepared preprod securities under the arm which allowed us to record the drums, bass and rhythm guitar all in just two days. We were all three in the same room to interpret the songs and I think this is thanks to this that the album sounds so natural and alive, both accurate and consistent, while keeping a groove and a symbiosis are only possible in playing together and not everyone turn to a computer. Read the band's studio report for more details.